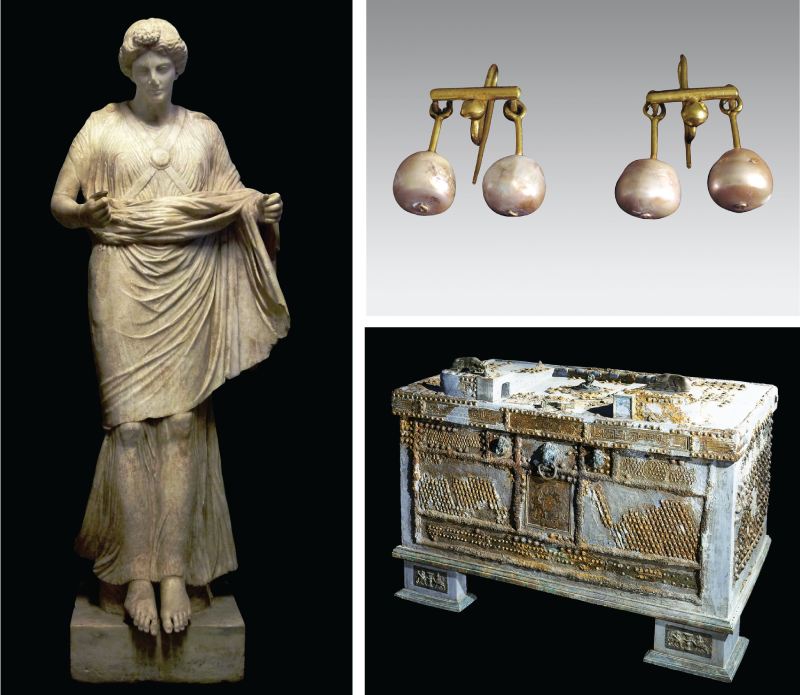 Landing Nike/Victory [mid-1st c. AD/pentelic marble] (left), double-pearl-pendant earrings [1st c. AD/gold and pearl] (top right), Strongbox [3rd-1st c. BC/iron, silver, bronze, copper] (bottom right) / Images courtesy of the U-M Kelsey Museum of Anthropology. The University of Michigan Kelsey Museum of Anthropology’s Leisure & Luxury in the Age of Nero: The Villas of Oplontis near Pompeii has everything going for it that a supremely superior museology project can have going for it. It’s a remarkable detective story thousands of years in the making, complete with bona fide top-notch investigators. And, not the least, it is a visual feast for the gallery browser who is willing to take the time to investigate the proceedings at hand. As Kelsey Curator Elaine K. Gazda tells us, the exhibit “explores the lavish lifestyle and economic interests of ancient Rome’s wealthiest citizens from the time of Julius Caesar (around 50 BC) to the eruption of Mount Vesuvius AD 79. On view are spectacular marble sculptures and wall paintings from an enormous luxury villa that may once have belonged to the Roman empress Poppaea, second wife of Nero." This succinct synopsis pretty much covers the territory of the exhibition, but it’s the hard-earned work on display that makes this such an exceptional museological project. These artifacts give the exhibit a previously uncirculated authenticity that’s quite exciting—as well as illuminating of this ancient period of history. As anyone who has visited the ruins of this area with the still-smoldering Vesuvius in the background can tell you, the distances depicted in Leisure & Luxury are far shorter geographically than the imagination might lead us to believe. Situated in the hills off the Bay of Naples, the city of Pompeii took the brunt of the two events on August 24-25, 79 AD—a first day of gas and volcanic ash extending high into the stratosphere that produced a pumice rain southward of the cone that built up to depths of nine feet, followed by another day of gas and hot rock that buried the city in two flows and engulfed the bay of Naples. But equally devastated were the coastal cities of Herculaneum (to the northwest across the bay) and Oplontis (situated three miles away slightly northwest on the coastline). And this is where the detective story begins in earnest. The excavation of some public baths in 1834 identified the long lost city of Oplontis as a middle-sized town with wealthy villas and a well-developed residential community. But it took systematic excavations between 1964 and 1984 to unearth several important villas, most notably “Villa B,” a house that is now known as the Villa of Lucius Crassius Tertius, where more than 50 bodies were found. Inside, excavators found piles of jars that indicated the villa was a business center where wine, oil, and other agricultural products were manufactured, processed, and sold. Yet as archeologically important as this "Villa B” has proven to be, the arguably more sensational excavation is the now-called “Villa A” of Poppaea Sabina, named after emperor Nero’s second wife, which was situated on the coastline between Naples and Sorrento. This luxurious villa, buried under 28 feet of pumiced ash, was first discovered during the construction of the 18th century Sarno Canal at the modern city of Torre Annunziata, when plundering mid-19th century French excavators removed several paintings from the villa and uncovered its lavish peristyle garden. Flash forward to the late-20th century through the present and one encounters the work of University of Texas Art Historian John R. Clarke, who with colleagues founded the Oplontis Project. Housed in that university’s Department of Art and Art History, the project was founded with private funds, University of Texas Funds, and the National Endowment for the Humanities through special permission by the Italian Ministry of Culture with the cooperation of the Archaeological Superintendency of Pompeii. The current result is a handsome recounting of this history, edited by the U-M’s Gazda and Clarke and now on view at the Kelsey Museum. Small Fragment with Ionic Column and Architrave [50 BC/fresco on plaster] (left), Fragment of a Figure of Eros [45-79 AD/fresco on plaster] (center), Fourth Style Ceiling Fragment with Hippocamp [45-79 AD/fresco on plaster] (right) / Images courtesy of the U-M Kelsey Museum of Anthropology. And what riches are on display: architectural components such as a mid-First century Corinthian capital with a ring of eight acanthus leaves at the bottom, lately excavated in a storage place that decorated (or was meant to decorate) a wing of "Villa A" that was undergoing renovation at the time of Vesuvius’ blast. Likewise, there are wide ranges of painting fragments uncovered from the now-called Atrium Five, with reconstruction renderings that indicate where these frescos would have been situated at the original site. Of commercial importance are first-century silver spoons, earrings, bracelets, a gold necklace, double pearl-pendant earrings, and a variety of recently minted first-century coins. Yet of all these treasures, among the most poignant is a delicately rendered, re-pieced-from-fragments, first-century BC, white marble “Aphrodite/Venus,” whose left foot is raised above a diminutive standing Eros, and whose left hand holds an apple resting on a smaller female statue. Oddly enough, a slight disfiguration of this Aphrodite’s nose completes her rescue from oblivion. We cannot know for certain if this is a depiction of the goddess. As Gazda writes, “It is not clear who is represented in the sculptural support, and there are no parallels that might identify her.” As such, the statue may be a play in time as well as in meaning, a folding of fate from within both idolatry and mythology through the conceit of all-too-familiar vanity—as unexpectedly undone by nature. But that was then—and this is now. As Leisure & Luxury whole-heartedly shows us, there’s so much more we can—and must—learn from what little past we have. We’ve literally just scraped the surface. As “Aphrodite/Venus” might tell us if she could speak, there’s a fantastic world beneath our contemporary world awaiting excavation. And this is the exhibit’s most enduring legacy. University of Michigan Kelsey Museum of Anthropology: “Leisure & Luxury in the Age of Nero: The Villas of Oplontis near Pompeii” will run through May 15, 2016. The U-M Kelsey Museum Meader Gallery, Second Floor of the Upjohn Exhibit Wing is located at 434 S. State Street. The Kelsey Museum is open Tuesday-Friday 9 a.m.–4 p.m.; Saturday and Sunday 1–4 p.m. For information, call 734-764-9304. 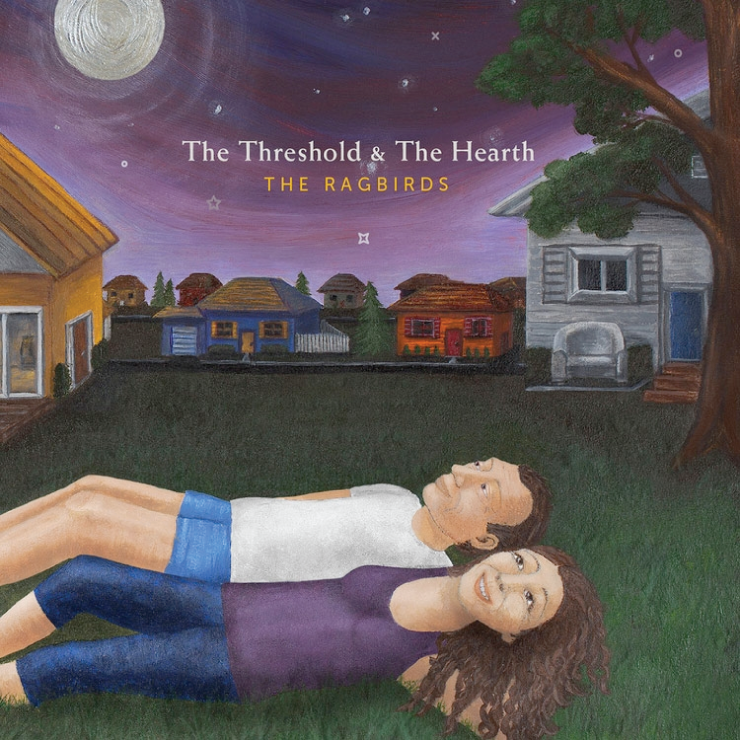 Today is a good time to begin listening to the Ragbirds' new album, The Threshold and the Hearth. 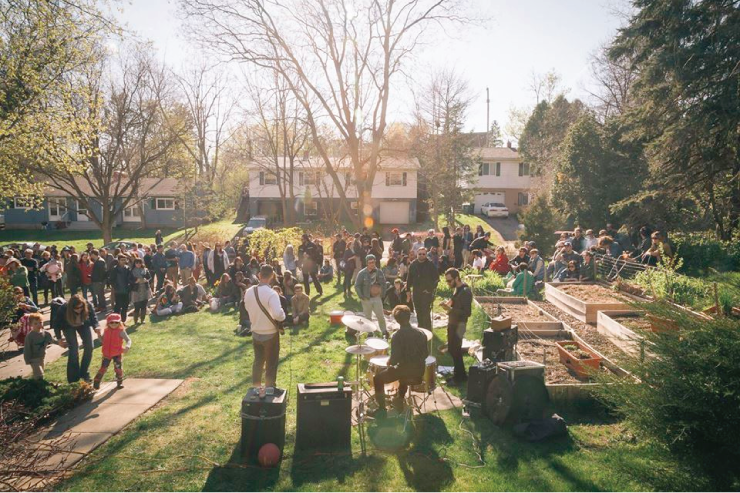 The easy sound byte about the Ragbirds’ new album, The Threshold and the Hearth, is that it’s the Ann Arbor folk band’s first release since band cofounders Erin Zindle and Randall Moore had their first child. One might expect more than a couple dewy-eyed reflections on new parenthood, if not an album full of them, but the Ragbirds seem to have their eyes set on bigger things. Structured as a loose concept album about the ups and downs of a fictional couple’s relationship, The Threshold and the Hearth is certainly informed by a newfound sense of wisdom and maturity, but it’s not obsessed with the personal particulars of Zindle and Moore’s very recently changed lives. In fact, if you’re going to read anything too personal into the album, Zindle kicks things off by asserting her status as an inveterate musician, unchanged by the years. “I was born in a lemon grove with a fiddle / Not a stitch of clothes,” she sings in opening track “Lemon Grove,” naturally backed by a jaunty and immediately catchy plucked fiddle riff. The track builds beautifully, eventually incorporating a rollicking drumbeat, harmonies, and a fiddle solo. For those who know the band, the tune is classic Ragbirds: upbeat folk, in the sense that it features some acoustic, traditionally Appalachian instrumentation and because the music industry requires an easy genre tag for the sound. But otherwise it’s the wholly unique product of Zindle’s world-spanning blend of musical influences and her pop sensibility for a great hook. Zindle stretches that sound even more as The Threshold and the Hearth goes on. “Cosmos,” with its charming lyric setting up the album’s central relationship between “a cosmologist and a cosmetologist drinking cosmos at the club,” has a funky little guitar and bass riff. “The Curse of Finger Pointing” makes lovely use of kalimba and some African-inspired percussion for a sound straight out of the Paul Simon playbook. And on “Strange Weather” Zindle quietly pours her heart out over a minor-key piano ballad. The album’s most downbeat cut, the beautiful “Strange Weather,” chronicles the low point in the record’s central relationship. But even amongst doom-laden imagery, Zindle conjures hope. “If I build a fire to melt the frost / If you stop the winds before they gust / We can save our love before it’s lost / Before we become just rubble and dust,” she sings. The tune ends on an unexpected major chord. While she may be positive-minded, Zindle’s certainly not wearing rose-colored glasses. Her songwriting here reflects a thoughtful adult perspective on love and life that uses hope as a weapon to cut through the rough stuff. Beyond the band’s songcraft, musicianship on The Threshold and the Hearth is excellent as well. Zindle’s dusky voice is expressive and engaging as ever, although it’s impossible to ignore the equivalent personality she puts across through her fiddle work. Zindle’s brother T.J. is also a standout here, lending warm, occasionally jazz-inflected guitar licks to songs like “Tough Love” and “On Your Side.” Bassist Dan Jones subtly lends weight to a few of the fiddle riffs, harmonizing with Zindle, and Jon Brown and Moore fill out the sound with a versatile complement of percussion. The Threshold and the Hearth garnered a newfound national distribution push from the Ragbirds’ signing with Rock Ridge Music, and the band enlisted the producing talents of Grammy-nominated R.E.M. and Ryan Adams collaborator Jamie Candiloro for the record. Those decisions seem to have paid off well for the band, as The Threshold and the Hearth debuted at No. 20 on Billboard’s folk chart. And rightfully so. It’s a pleasure to see this band growing up and just getting better, stronger, and smarter with age. Patrick Dunn is an Ann Arbor-based freelance writer whose work appears regularly in the Detroit News, the Ann Arbor Observer, and other local publications. He also believes in optimism, but secretly expects the worst. The Threshold and the Hearth is now available in physical form at the Ragbirds’ online store and in digital form on major streaming services. 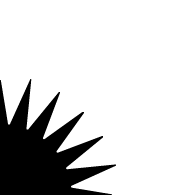 Don't believe the hypotenuse in Theatre Nova's Irrational. You don’t get much quirkier than the concept for Theatre Nova’s new production Irrational, a rock musical about ancient Greek mathematicians. The show by Ann Arborites David Wells and R. MacKenzie Lewis follows the con man Hippasus (Sebastian Gerstner) as he attempts to ingratiate himself with the powerful cult leader Pythagoras (Elliot Styles). But Hippasus’ plan to use his newfound social stature to win the beautiful Eloris’ (Tara Tomcsik) hand in marriage–and more importantly, her wealth–goes pear-shaped when Hippasus inadvertently introduces the concept of irrational numbers into Pythagoras’ ratio-obsessed sect. It’s a rather bizarre story at face value, even more so given that it’s at least somewhat based in historical record. Pythagoras, namesake of the famous theorem, did in fact lead a movement known as Pythagoreanism, and legend has it that he also had a man named Hippasus put to death for introducing the concept of irrational numbers. Wells takes this odd bit of mathematical lore and thoroughly has his way with it, adding a number of third-act twists and fleshing out a love triangle between Hippasus, Eloris, and the forthright Pythagorean Theodusa (Emily Brett). The strongest moments in this unusual riff on ancient history are consistently those involving Styles’ Pythagoras. Styles, only two years into his musical theater studies at the University of Michigan, is the play’s comic center of gravity. Clad in white plastic-framed glasses and a flowing white tunic and pants, Styles fully grasps the humor inherent in his nerd rockstar character and plays it for all it's worth. He has the grace to pull off a few surprising physical stunts, the presence to fully project Pythagoras’ bluster, and vocal chops that even extend to pulling off a well-placed rap in Pythagoras’ self-aggrandizing showstopper “Mononymous.” The character is over-the-top, of course, but with Styles in the role you won’t doubt Pythagoras’ power for a second. Styles is helped along by a generally well-used Greek chorus, an entertainingly sassy trio of gamblers played by Anna Marck, Esther Jentzen and Emily Manuell. The three harmonize beautifully and frequently pump up the humor of Pythagoras’ numbers with fawning girl-group backup vocals and a smattering of hip-hop dance moves. Wells overuses the trio for exposition, however, as the chorus repeatedly re-explains plot developments made perfectly clear in song moments before. Tomcsik is a sly supporting player, punching up several laugh lines that are good on paper but surprisingly hilarious thanks to her delivery. Brett puts considerable physical energy into her performance, if not quite the inner confidence that her character is written with, and Matthew Pecek is amusingly game as a disenfranchised Pythagorean. Gerstner, however, doesn't quite match the personality and comic energy summoned by Styles, Tomcsik and other costars. Hippasus ought to be at least Pythagoras’ equal in charisma, but the character never quite pops. That probably has something to do with the fact that Wells and Lewis seem to inject the lion’s share of their creative energy into pretty much everything except Hippasus. We never quite get a sense of our leading man from square one, and his crucial relationship with Eloris is established in a single musical number that isn’t enough to sell us on her connection to him. Lewis’ score may be at its best when Pythagoras and the chorus are involved, but it’s consistently strong throughout the play. Lewis’ songs are excellent, mostly traditional show-tune stuff with bits and pieces of funk, R&B, and rock thrown in to lively effect. His work here is sometimes quite complex, with some of the group numbers featuring accomplished use of counterpoint and harmony. The tunes are thoroughly catchy and you’re likely to walk out of the show with at least one of them stuck in your head. 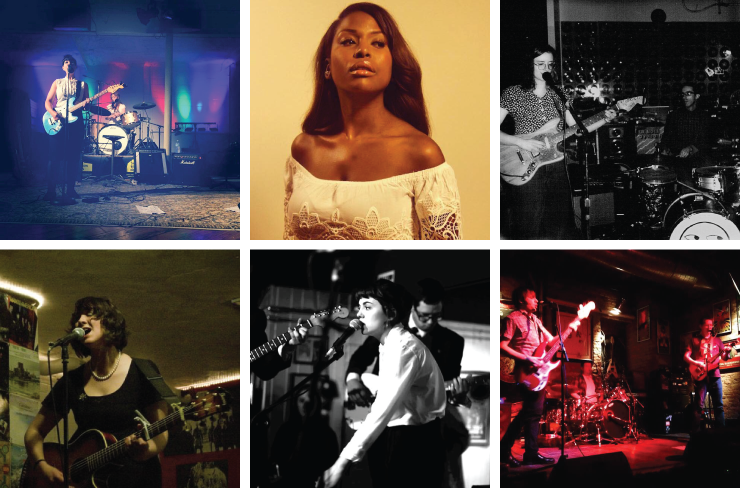 Perhaps the most ambitious task Irrational sets itself is pulling off a full-fledged musical in Theatre Nova’s extremely intimate stomping grounds at the Yellow Barn. Director Carla Milarch makes the best possible use of the theater’s small thrust stage, successfully blocking the actors to play to audience members on all three sides of the sparse set and choreographing to the greatest extent that the space allows. But there’s simply no room for a live band in this setting, which is something of a shame given how good Lewis’ score is. On opening night the prerecorded score seemed surprisingly quiet; the coming performances of the show would be served well by cranking up the volume and letting the music soar a little more. Irrational is far from a perfect production, but it certainly doesn’t lack for creativity, originality, or enthusiasm. Wells and Lewis deserve major props for conceiving such a singular idea, and Milarch deserves the same for her efforts to bring it to life in this challenging space. The Irrational team did two years of workshopping to get the show to this point, and it’s easy to see something truly great emerging with a bit more refinement. 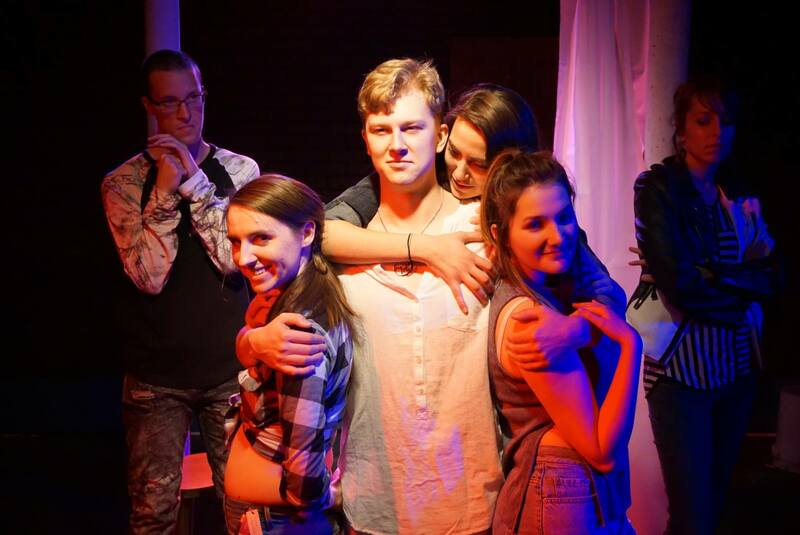 We’re fortunate to have creative minds in town coming up with big, crazy, fun ideas like Irrational, and even more fortunate to have an outfit like Theatre Nova that’s willing to realize those ideas onstage with professional craft. Although it has its flaws, Irrational is a lot of fun and it deserves the attendance to prompt the additional development that a second (or third or fourth) staging might bring. Where else are you going to see a rock musical about ancient Greek mathematicians? Patrick Dunn is an Ann Arbor-based freelance writer whose work appears regularly in the Detroit News, the Ann Arbor Observer, and other local publications. Like Pythagoras (or Prince), he intends to one day be known by just one name. 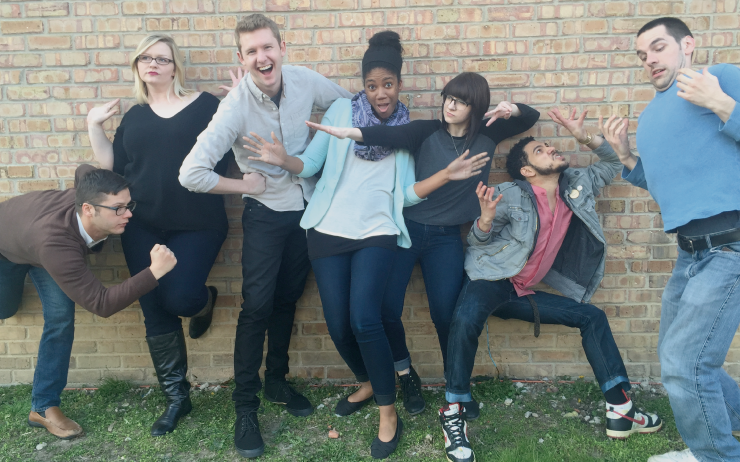 Irrational runs April 22 through May 15 at the Yellow Barn, 415 W Huron St. Tickets are $20 and showtimes are 8 pm Thursday, Friday, and Saturday; and 2 pm Sundays. 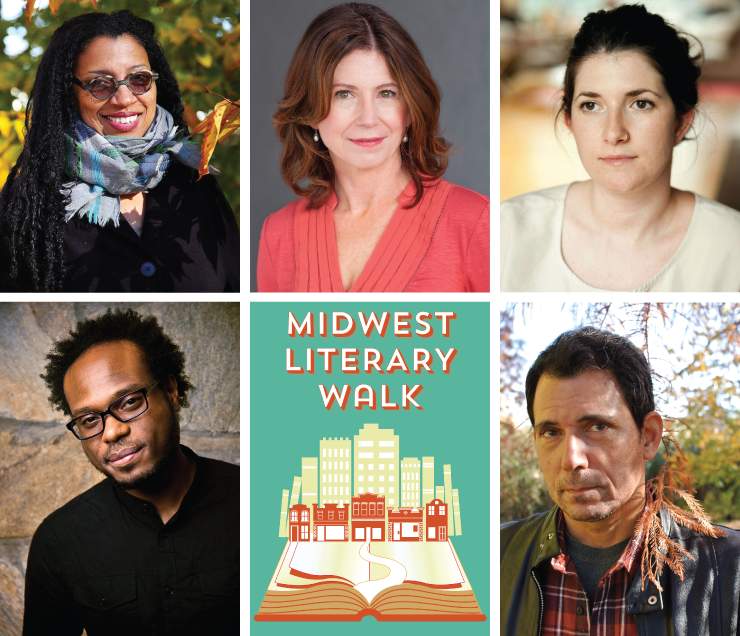 This year's Midwest Lit Walk features (clockwise from lower left): Jamaal May, Robin Coste Lewis, Paula McLain, Claire Vaye Watkins, and Christopher Sorrentino. Back for its 8th year, the Midwest Literary Walk showcases nationally-lauded authors and poets at various venues throughout downtown Chelsea. 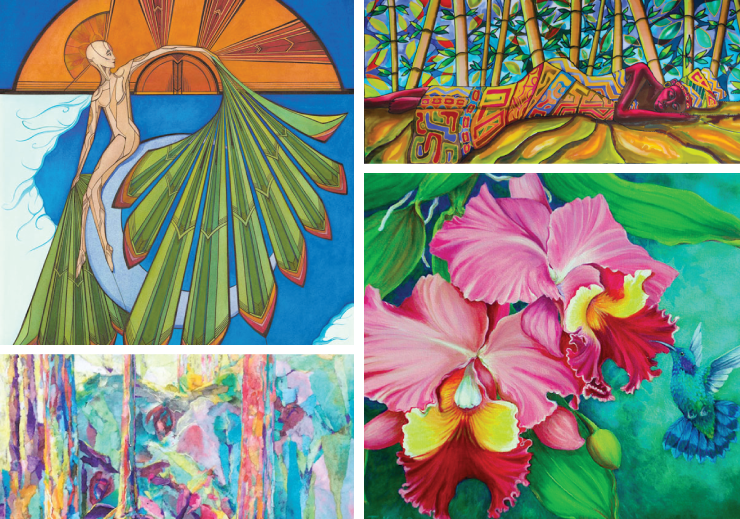 The event will be held on Saturday, April 30 from 1-5 pm and is free to the public. At 2 pm, National Book Award “5 Under 35” honoree Claire Vaye Watkins, author of Gold Fame Citrus, will also read at the Chelsea Depot. The hauntingly beautiful Gold Fame Citrus takes place in a future American West ravaged by drought and follows a young couple and mysterious child as they try to make their way to a better life. The Midwest Literary Walk then moves to the Clocktower Commons at 320 N. Main St. for Robin Coste Lewis (Voyage of the Sable Venus), winner of the 2015 National Book Award for Poetry, and Jamaal May, an American Library Association Notable Book honoree. 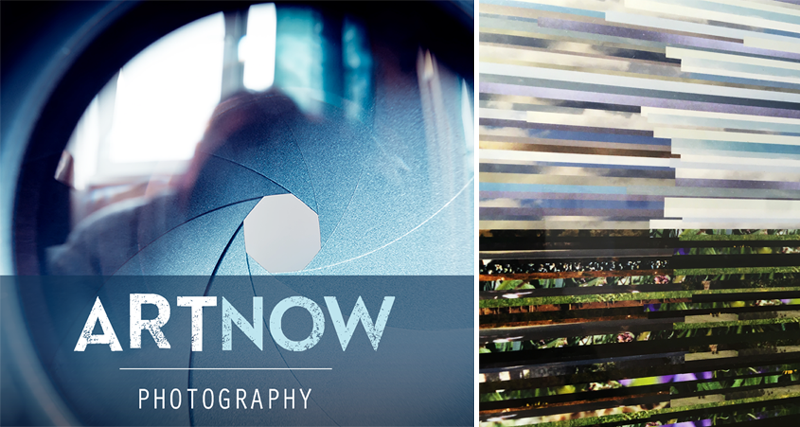 At 3 pm, the two poets will discuss their art form, interspersed with readings of their work. At 4 pm, novelist Paula McLain, whose bestsellers include Circling the Sun and The Paris Wife, will take the stage at the Clocktower Commons. McLain’s latest, Circling the Sun, brings to life the fearless and captivating Beryl Markham, a record-setting aviator caught up in a passionate love triangle with safari hunter Denys Finch Hatton and Karen Blixen, who, as Isak Dinesen, wrote the classic memoir Out of Africa. At each reading location, the authors’ books will be available for purchase from Literati Bookstore, and time for book signing is incorporated into all sessions. Additionally, many downtown Chelsea businesses are offering discounts to attendees of the Midwest Literary Walk on the day of the event. Following the final reading, participants are invited to the Chelsea Alehouse at 420 N. Main St. for a casual afterglow. Tune in to WDET's Detroit Today with Stephen Henderson on 101.9 FM to hear an interview with a different author each Friday between now and the Midwest Literary Walk. The show airs from 9-10 am and re-airs from 7-8 pm. Community contributor Emily Meloche is an Adult Services Librarian at the Chelsea District Library. The 8th Annual Midwest Literary Walk will be held on Saturday, April 30 from 1-5 pm at venues throughout downtown Chelsea, and is free to the public. For more information on the 2016 Midwest Literary Walk, the authors, and their works, please visit midwestliterarywalk.org.